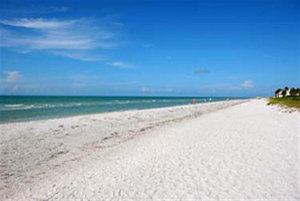 Sanibel Island Real Estate, Captiva Island Real Estate - Sanibel Island Beaches! Our World Famous Beach Community! Click the above map for an explanation of beach access points! 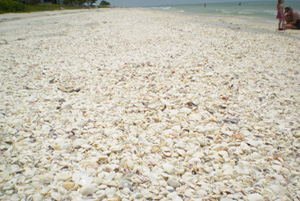 Let's face it, Sanibel Island is most famous for its beaches. Sure we have incredible wildlife preserves, restaurants, shops and bike trails, but the shells and the beach are what people suffering through cold winters are thinking about. 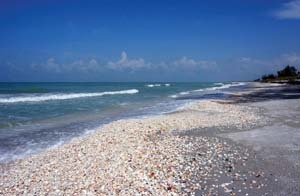 Sanibel has about 11 miles of incredible beach and Captiva Island has about four miles of beach. 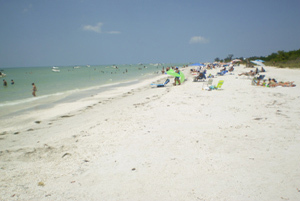 Sanibel has public beach access points as well as restricted beach access areas. You can use an interactive map HERE to point out each area. Our beaches have a bit of everything. Near the eastern end (Lighthouse pics and info) you have, public parking, great views of Fort Myers Beach, and the waters of the Gulf of Mexico and San Carlos Bay on the inland side. Sanibel's Historic Lighthouse is always worth the visit, even if you don't want to spend your day at the beach. People are always asking me where the best shells are, and the answer to that varies with the weather. After a storm, or strong wind and waves off the Gulf, you can find shells just about anywhere along our beaches. But for a definitive answer for "most likely" spots in any weather, I'd have to say Boman's Beach ("C" on the above map), which offers public parking and restrooms. I also like Blind Pass Beach ("B" on the map) for shelling. Blind Pass also has public parking. 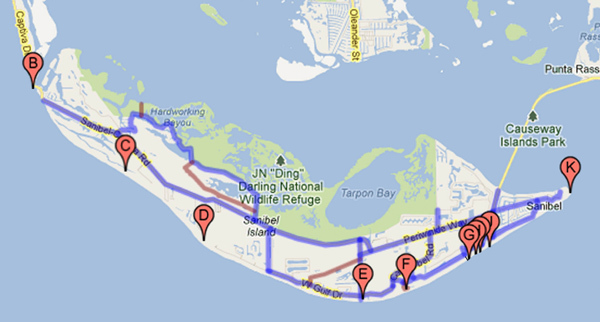 All of the beach access points on the above map allow walkers and bike riders access to the beach. For residents and property owners with a parking permit obtained at the Rec Center, there is limited parking. Our beaches are open year-round and you will never have to fight the crowds you find in Fort Myers Beach or at many of our Florida beaches. On Sanibel you can even take your dog (just keep him/her leashed!). How can you go wrong with all Sanibel and Captiva Islands have to offer? Come on down and check us out! While you're walking along doing the "Sanibel Stoop" as you look for shells, check out some of the homes along our shoreline. I can help you find the perfect home, condo or homesite on, or near, the beach. This is a great time to look for Sanibel real estate - our winter crowds have gone and the summer heat is still months away. We have a good inventory of reasonably prices properties and I can help you from offer to closing! As a long-time island resident I'd love to meet you and show you what's available on our islands! Give me a call now at 239-691-4915 or use my Contact Form and we can get started on your perfect island property!